Fruity on the nose with delicate red wine aroma, beautifully mixed with peat smoke and a touch of ash. Notes of creamy vanilla and caramel arrive nicely wrapped in sweet smoke, wine grapes and an appealing mix of spices - coriander, juniper and white pepper. A hint of maritime notes with a touch of tobacco leaves in the background. 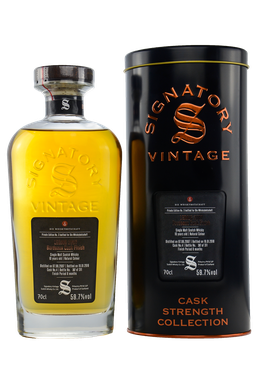 Bold and intense on the palate with peat smoke, vanilla sweetness, malty notes and honey. This is accompanied by a warming spiciness of black pepper, ginger and nutmeg. Lingering red grapes mixed with a hint of fresh lemon and dry notes of oak and allspice towards the finish. The finish is long, pleasantly warming and sweet with honey, grapes and fudge. Again slightly smoky with a hint of salt and a whiff of bitter dry oak on the tail. There's almost no change on the nose when a splash of water is added. The delicate sweetness and smokiness both remain stable. On the palate, however, the sweet and fruity notes are almost tamed while spicy flavours - pepper, allspice and cloves - take over along with earthy peat. The finish is still long, warm and creamy with malty notes, dry oak and a hint of red grapes. Although the finish was done in a French Bordeaux wine cask, the distillery character of Ledaig is unmistakable. Smoke and peat, wonderfully paired with a creamy vanilla sweetness and fruity wine aromas. Aromatic on the nose, intense and very strong on the palate. Nevertheless, this pleasantly complex and not too young Ledaig is perfect to be enjoyed neat. Something for the cold evenings in front of a log fire. I thank Die Whiskybotschaft for the photograph!